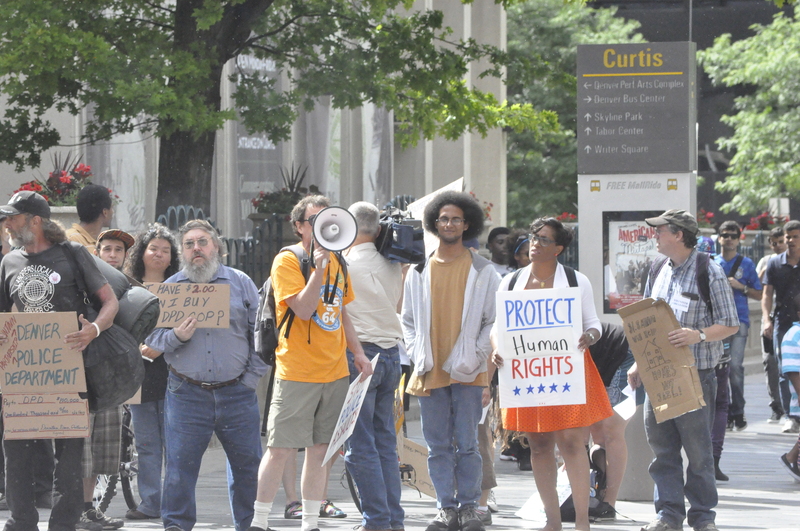 $1.8 Million approved for police to increase enforcement against sleeping, peeing, asking for help, and otherwise trying to survive: On Monday we stood together to say NO! 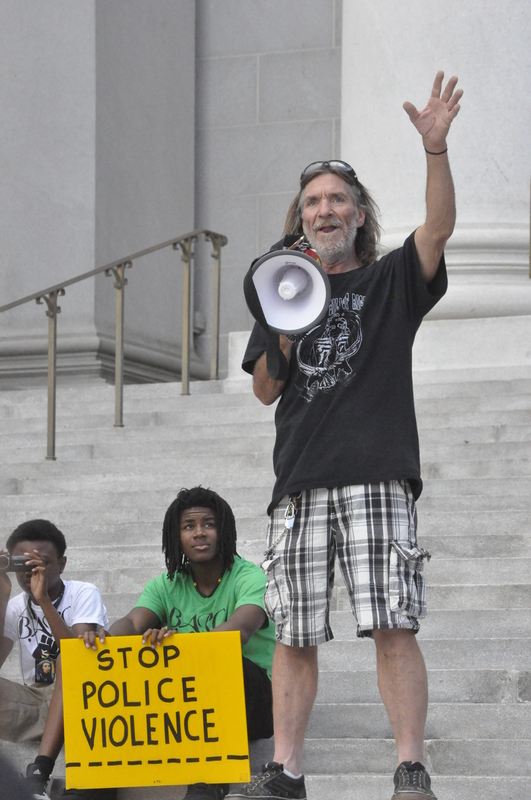 Take a Stand Against Excess Criminalization! 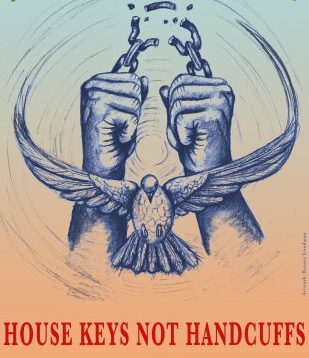 Homes Not Jail! City Council is proposing to spend 1.8 million taxpayer dollars to significantly increase policing downtown. The Downtown Denver Business Partnership, Business Improvement District, and VISIT Denver are throwing down an additional 160,000 dollars directly to the Denver Police Department to heavily police the mall. This is happening at a time that Denver Police are facing numerous investigations on a Federal and State level for increasing amounts of improper conducts and abuse of powers. 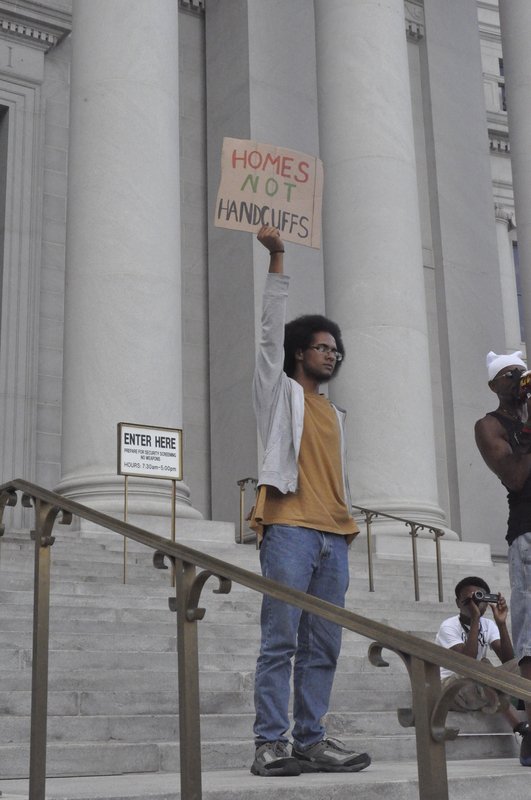 Being harassed by police, ticketed, arrested, and spending time in jail for basic acts of survival increases homelessness and infringes on basic human and Constitutional rights. Join us Monday June 23th at 3:30p.m. 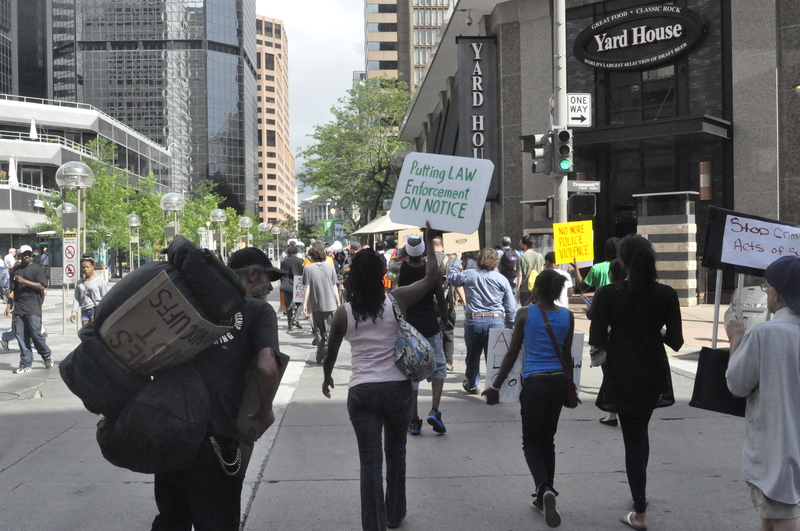 at Skyline Park (16th and Arapahoe) to walk the mall and unite at the front of the City Council building at 4:30 p.m. to take a stand and speak out not just for the rights of homeless people, but for all people’s rights. Then join us at the City Council Meeting at 5:30p.m. On Wednesday June 4th Mayor Michael Hancock introduced BR14-0440 at the Government and Finance subcommittee. For a special allocation for more police officers in downtown areas and expected incarceration costs. April 21, 2014 The Denver Post reported. Then on May 19, 2014. “To immediately address increased demands and current issues.” In police district 6. 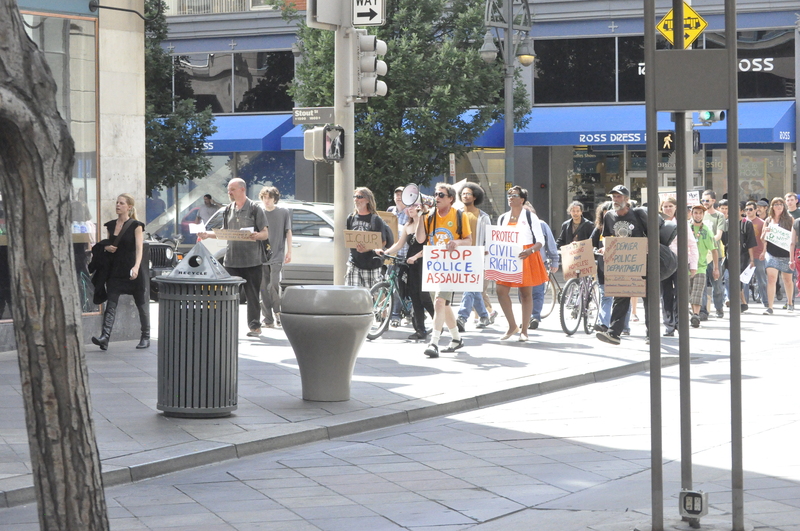 These increased demands would seem to suggest that the “issues” are connected with the HOMELESS alone and have little or nothing to do with the local businesses, Ballpark residents, kids in the area, patrons of establishments in the area, the general public and/or the rapid growth of Lodo, downtown and Ballpark over the past four years. Something has increased. More people? More building? More businesses? No not at all. There’s just more HOMELESS people. Now, It’s my understanding that approximately half of this budget will be spent on an additional ten cops in district 6 and, that the remainder of the $1.8 million will go to “cover an anticipated increase in arrests and detention costs.” specifically 330 detainees. how do they know that? Are they only going to arrest 330 individuals? what if there are 332 crimes committed downtown next year? Chief White at the government and finance meeting that the police would give warnings and hand out citations before arresting people. So, where does the 330 come from and what’s the additional $900.000 for? if there are no detainees to detain. It’s pretty clear to me, That this is just a blanket (pun intended) to give the Denver police another means to arrest more of the HOMELESS. So, as long as I don’t smoke pot, I don’t do what I can to get a buck, I don’t urinate or I don’t sleep, I ll be able to live and thrive with an over whelming Quality Of Life. I guess I should say Thank You to Ballpark, Denver Downtown Partnership and all the other fine people concerned with my well being. Now, I’m not strictly opposed to more cops downtown, or in Lodo or even in the Ballpark neighborhood. More people simply means more problems. On Monday June 2 at approximately 2:30 am, while three people were getting hamburgers, a triple shooting occurred. BTW There’s no fast food places at all in this area of Council district 9. Oh wait, there are no specific mentions of any problems. Maybe they mean more beds, jobs and rest rooms. Those are some” long standing problems connected to the HOMELESS. Although the article in the post doesn’t mention any specific problems. At the government and finance committee it was made all to clear. The issues specifically mentioned were public pot smoking, panhandling and public urination. These are pretty specific issues aimed at a pretty specific group of people (HOMELESS) in order to pacify another specific group of people. (Some people living in the Ballpark neighborhood ) Say it with me, Dis-Crim-In-Ation. And now to consider these serious issues with the appropriate respect. let’s start with the last issue, being that it’s not a favorite subject. Can I just state the obvious here? If You Gotta Go, You Gotta Go!! It happens to all of us. Sometimes there is either no place to go or they are all locked tight. Try this, google. ” peeing in public”. no, really go ahead I’ll wait…….there’s a lot of videos right? My point is, if you’ve just left an establishment after drinking a few beers with your friends at 2:00 am and find you have to go. You,re going to find a place to go. I’m sure some of you are blushing right about now. Show of hands please. I’ll be honest. I’ve done it. A few blocks from the stadium. back when I was an Insider. (One who lives in a home.) They just can’t all be HOMELESS. And just what happened to all those Portapots on and around the Platte? So, while the city is working on getting us some public rest rooms this week. they might want to think about some of those nice trash cans also. Panhandling is to ask strangers for money in a public place. And here’s a real shocker. Hey Denver Downtown Partnership, Pay attention. Not all panhandlers are HOMELESS. The Northeast Ohio coalition for the HOMELESS estimates that only 40%–60% of panhandlers are HOMELESS. Then there are the Green Peace people and the save the rain forest people and the save the tigers people and the save a tree kill a lumber jack people and………Well, You get the point. They,re just not all HOMELESS. BTW The money that those strangers give to the panhandlers does not get sent off to our secret HOMELESS people bank. That money goes right back into the community. Whether it’s spent on sandwiches, cigarettes or booze. the money gets spent here in local stores. I need to confess, I don’t smoke pot, No really, I don’t…No Really!! Public pot smoking is a bad idea. but, drinking ten beers at a Rockies game and driving the kids home is a bad idea. Drinking ten beers at a Broncos game and driving your buddies home is a bad idea. Drinking alcohol until 2:00 am is a bad idea. And apparently buying hamburgers at 2:30 am in police district 6 in Denver is a Really Bad Idea. Its not just some of the HOMELESS with a bad idea. Then there’s the $56.00 a day in jail costs. I certainly don’t have that kind of money! that’s ok the Denver tax payers will pick up the tab. But not the rich folks. Oh and btw if you happen to have an extra $100.000 laying around you can buy your own police force. just ask the Downtown Denver Partnership. That’s right Denver Downtown Partnership gave the Denver Police Department $100.000 to add a cop every block Downtown. Ten More Cops for What? 1.8 million additional city dollars have been proposed to spend policing downtown. A top priority is policing people for the “criminal acts” of being homeless – including but not limited to, not having an indoor place to sleep or urinate, and asking for money when you have none – instead of using this 1.8 million for housing, bathrooms, or jobs. If this proposal passes, $900,000 would be spent to add 10 police officers to patrol the so-called “hot spots” of the 16th St Mall, the Ballpark neighborhood (where St Francis Center, the Rescue Mission, Samaritan House, and many other services for homeless people are located), and Lodo. Another $900,000 would be spent on estimated increased “arrest and detention costs.” Alongside this $1.8 million of city budget, the Downtown Denver Partnership has already spent $100,000 of their own money to hire one additional officer per block along the 16th St Mall. This request for additional policing was made by Mayor Hancock in an effort to accommodate the complaints of the Ballpark Neighborhood Association about the Lawrence St Community Center addition to the Denver Rescue Mission recently approved by the City Council. Of course it would be unconstitutional discrimination for city officials to direct the police force specifically to target people who are homeless because of their housing status. So instead they explain that it is not about homelessness itself but about “criminal activity.” What sort of criminal activity? 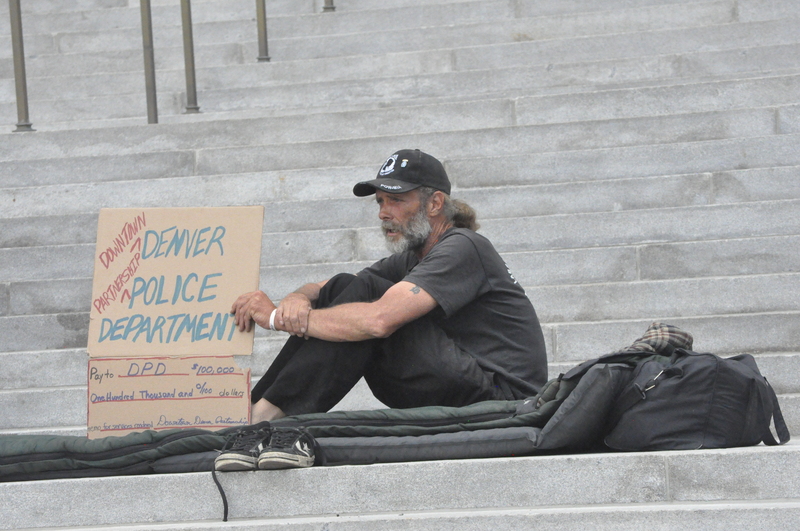 Panhandling, smoking weed, and public urination were three top crimes mentioned by Denver Police Chief Robert White. Plus of course the crime of sleeping in public. Laws against sitting/lying down along the 16th St Mall, and “loitering” in various areas will also be enforced. So while Chief White and others can claim “homelessness is not a crime,” trying to exist and survive in public space is a crime. If you don’t have a home of your own to sleep, sit, or urinate in, and the only place you have to do these things is public space, than you are by default a criminal. If panhandling is a problem, the solution would be for people who are panhandling because they lack money to be offered employment or a disability check that actually meets their needs. If public urination is a problem, the solution would be to have accessible public bathrooms for people to urinate in. -Right here in Denver’s own Washington Park the city is spending $160,000 for bathrooms (See http://www.westword.com/2014-05-15/news/rangers-in-denver-parks/) Why can the city afford to upkeep and clean the bathrooms in Wash Park and not downtown where people who are homeless have no place to use a restroom? If sleeping in public places is a problem, the solution would be to offer people housing they can afford. Write a letter to the editor by emailing openforum@denverpost.com(straight text only; no attachments).Letters guidelines: The Post welcomes letters up to 150 words on topics of general interest. Letters must include full name, home address and day and evening phone numbers. Letters may be edited for length, grammar and accuracy. Wednesdays 4:45pm at American Friends Service Committee room in the Court House Square apartment building, 901 W 14th Avenue. Come speak out at City Council Meeting when this proposal will be heard (date still unknown – keep an eye out for this announcement).